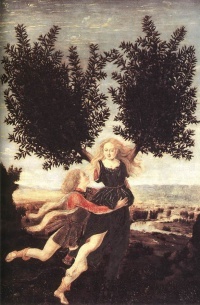 Heliades' metamorphosis into a tree. Metamorphosis is central in Ovid's Metamorphoses. The History of literature begins with the history of writing, in Bronze Age Mesopotamia and Ancient Egypt, although the oldest literary texts that have come down to us date to a full millennium after the invention of writing, to the late 3rd millennium BC. The earliest literary authors known by name are Ptahhotep and Enheduanna, dating to ca. the 24th and 23rd centuries BC, respectively. Texts handed down by oral tradition may predate their fixation in written form by several centuries, or, in extreme cases, even millennia. Classical Antiquity is usually considered to begin with Homer, in the 8th century BC. Many older literary texts are known, but often difficult to date. This includes the texts in the Hebrew Bible, the Pentateuch being traditionally dated to the 15th century BC, while modern scholars put it to the 10th century BC at the very earliest. An early example is the so called Egyptian Book of the Dead which was eventually written down in the Papyrus of Ani around 250 BC but probably dates from about the 18th century BC. 1900 BC Egyptian Westcar Papyrus; assumed age of the text, the surviving papyrus copy dates to ca. 1700 BC. Tale of Two Brothers from the Egyptian Papyrus D'Orbiney by the scribe Ennana. Unless indicated otherwise, the text in this article is either based on Wikipedia article "Ancient literature" or another language Wikipedia page thereof used under the terms of the GNU Free Documentation License; or on original research by Jahsonic and friends. See Art and Popular Culture's copyright notice. This page was last modified 20:54, 25 February 2013. This page has been accessed 2,395 times.